Utah's Crafty Chick: Ultimate Holiday Give-A-Way!!! For those of you who joined us on the show yesterday you watched as we gave away a NEW Cricut Cake machine...now it's time to give the rest of the gifts away! Gifts are listed below. Each gift has been assigned a number, with a short description. First email for each item is the winner, unless you have already won another item, then the next email will be declared the winner. Email body should contain ONLY your contact information. Contact information to be included: Name, address, city, state & zip code and phone number (with area code). Email entries will be accepted until 9pm, December 15, 2011, or until all prizes are awarded. Winners will be notified by Monday, December 19, 2011. ALL prizes MUST be picked up at the KUTV Channel 2 station in Salt Lake City by Dec. 31, 2011. Photo ID required to pick up prize. Included: 4 - 6X6 paper packs with coordinating brad sets. 2 Kreate-A-Lopes, 2 sizes (A2 & 6x6). Lick & stick envelope glue. Make your own envelopes in less than a minute with these templates. Special envelope glue allows you to add glue to the flap of your envelope and once it dries it can be moistened just like a store bought envelope. Gift Certificate for a one hour massage from licensed massage therapist Kim Paget. Relax away the holiday stress! Located in So. Ogden, UT. "Glamour Us Nails" by Cindee Bennett. Gift Certificate for your choice of: Glitter Toes OR Gel Glitter Nails OR 2 Week Manicure with Gel Polish. Look your very best this holiday season. Located in Kaysville, UT. Crafty Bride idea book (signed by the author), Mini 6X6 Bo Bunny wedding paper slab & 2" clear acrylic alphabet letters. 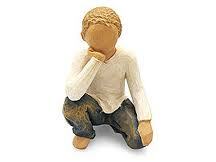 "Thoughtful Child" figurine. Beautifully created by Susan Lordi. "Spring Holiday" cartridge. Lots of fun cute shapes and sayings to celebrate those fun spring holidays. For use with the Cricut cutting machines. Red Necklace and earring set. Donated by Shauna Shaw/Independent Consultant. All jewelry $5.00 every day! Schedule your party now for all those last minute shoppers! A basket full of yarn for your crocheting or knitting project. Dark metal & black necklace & earring set. Donated by Shauna Shaw/Independent Consultant. All jewelry $5.00 every day! Schedule your party now for all those last minute shoppers! Eyelet setting tool. No banging a hammer to set your eyelets...just a twist of the wrist. Includes interchangeable tips to set 3 different sizes of eyelets. Eyelets also included. Little green table top organizer full of crafting supplies...Pen-Cut scissors, glitter flowers, ribbon, more! "Cherish" card kit. Make beautifully created cards with this simple kit. Multi-Strand necklace & earring set. Donated by Shauna Shaw/Independent Consultant. All jewelry $5.00 every day! Schedule your party now for all those last minute shoppers! 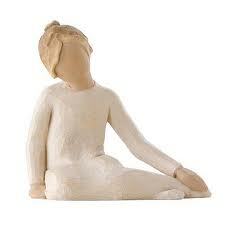 "Inquisitive Child" figurine. Beautifully created by Susan Lordi. 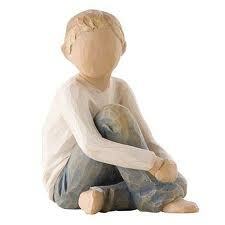 "Caring Child" figurine. Beautifully created by Susan Lordi. Cuttle Bug "Spring Floral" die.and embossing folders "Cat". For use with the CuttleBug die cut machine. Vinyl wall kit. Saying: "Make each day...your masterpiece"
Blue necklace and earring set. Donated by Shauna Shaw/Independent Consultant. All jewelry $5.00 every day! Schedule your party now for all those last minute shoppers! Stamp lovers pack! Foam alphabet stamp set, wood alphabet set and a set of tag stamps. 24" unfinished wood clock with sponge brushes and varnish. Create your own time masterpiece.